Presenting Romesco Sauce. Think roasted red pepper pesto. It’s nutty, with big bold flavors and is so versatile. This sauce can be served on pasta, as a dip for fresh veggies, or as a spread on sandwiches. But where we see Romesco really shine is when it’s paired with seafood. Romesco Sauce originated along the coast of the Mediterranean sea in the Catalonia region of Spain. As with many dishes that have evolved over hundreds of years, there are countless versions of this classic recipe. Most however include almonds, garlic, red peppers, tomatoes, smoked paprika, crusty bread, red wine vinegar and olive oil. And most of these ingredients are roasted or toasted before coming together as a sauce. Now tell me….what’s not to love?! Romesco Sauce is thick and dense with vibrant roasted flavors. If Romesco is new to you I highly recommend giving it a try. We baked a beautiful piece of halibut in the sauce and served it over pasta. Flavor wow! 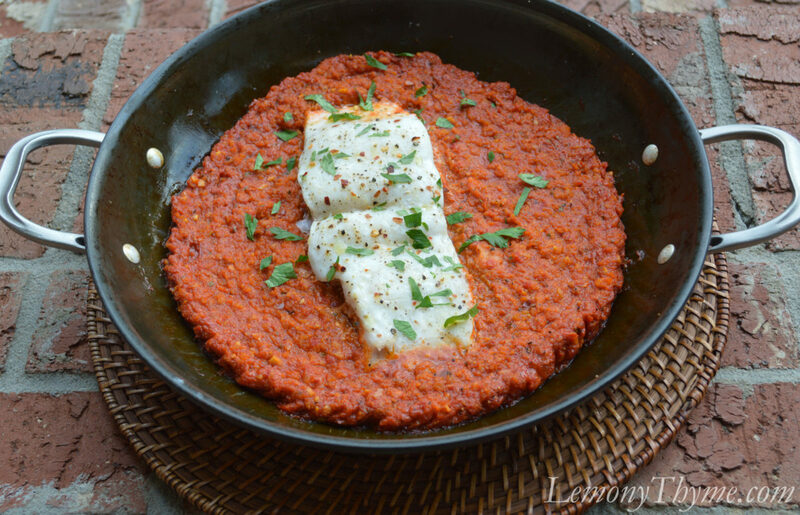 Here is the recipe link for Halibut in Roasted Romesco Sauce with Pasta. 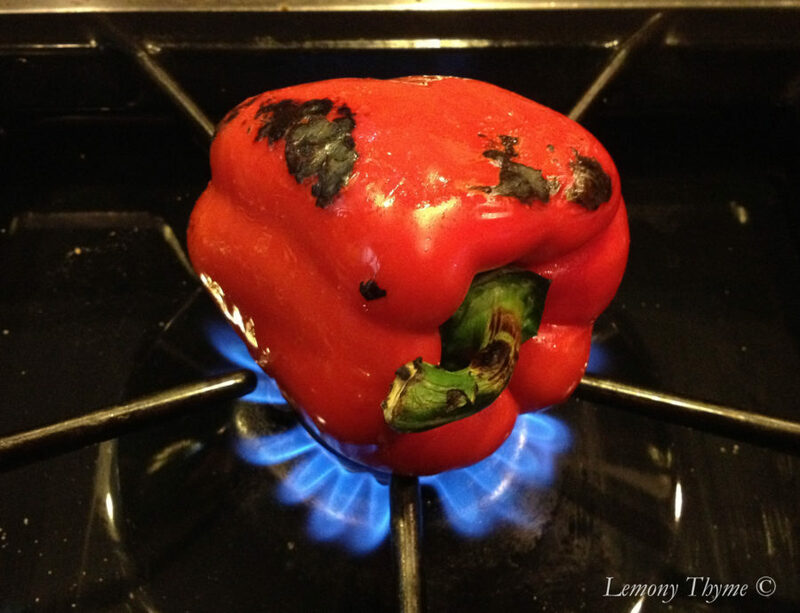 Recipe Note: To fire roast a red pepper…..
Char it well on all sides over an open flame or under a broiler, turning frequently with tongs. It will take up to 10 minutes to get well blackened. Place pepper in a bowl and cover with plastic wrap. This will create steam which will loosen the skins. Once the pepper has cooled, cut it in half removing the seeds and charred skin. Rinse to remove any remaining seeds or little bits of black charred skin. 1 lb. of tomatoes, skins and seeds removed or 1 15-ounce can of diced tomatoes. Slice top off the head of garlic and remove papery skins. Drizzle with 1 Tbl. olive oil. Wrap in foil and roast in oven for 30 minutes. Once done, squeeze the roasted garlic cloves out of the head. 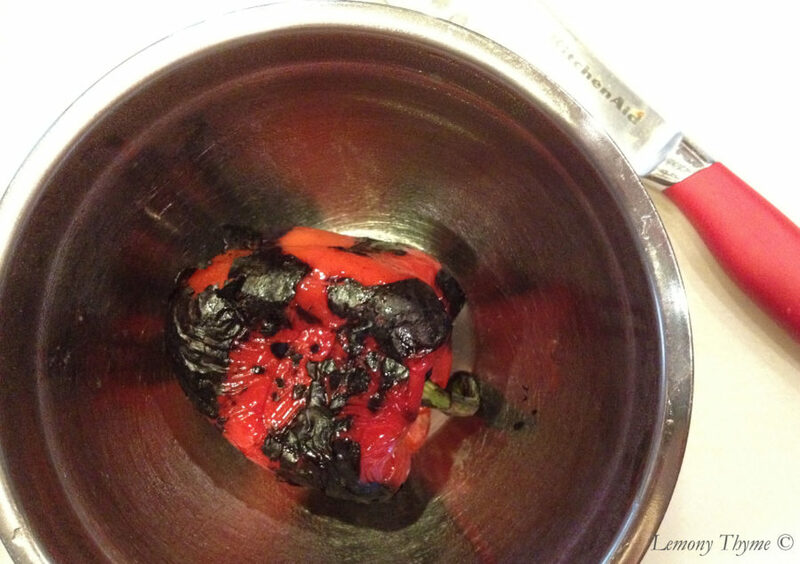 Meanwhile, if not using canned, fire roast the red pepper (see instructions in recipe post) and par-boil the tomatoes to remove the skins and seeds. Set aside. Toast the slivered almonds in the oven for 7-10 minutes or until just beginning to brown. Set aside. Heat remaining olive oil in a sauté pan over medium-high heat. Once hot, sauté the bread cubes lightly browning all all side. Add the roast garlic cloves, fire roasted red pepper, tomatoes, toasted almonds, toasted bread, vinegar, salt, smoked paprika, parsley and red pepper flakes to a blender or food processor. Puree until fairly smooth. To finish the sauce, add to a shallow rimmed baking pan and bake for 15 minutes. This will allow the sauce to thicken slightly and caramelize around the edges. Yields 1½ cups of sauce. To store, allow to cool and refrigerate in an air tight container for up to 7 days.